While it may seem like the age-old word-of-mouth marketing tactic generates enough business for your home improvement services, the question you need to be asking yourself is if this tactic is generating quality business. Word-of-mouth is certainly a beneficial business strategy , but it shouldn’t be your only strategy. 1) Get a mobile optimized website. Today’s consumers are hunting for contractors and other service providers on their tablets and smart phones. If they can't find you on your website, you're missing out on their business. Think of your website and social media pages as a digital business card that provides potential customers with more than service details, business hours and contact information. It’s a way for your business to connect with the consumer as a trustworthy expert. 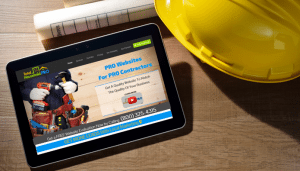 This marketing-must is both inexpensive and cost effective with services like TotalHousehold PRO, which designs and manages mobile optimized websites and social media pages specifically for contractors. 2) Evaluate the return on your advertising investment. Many contractors admit that they write out a monthly check for print ads without actually knowing if they're getting any results—often they just do it out of habit. Many are still using what's called old media—whether it's the local "Penny Paper" or a "coupon pack" mailing. Find out how much traction these avenues have and if they're increasing awareness about your company and getting your phone to ring. Remember that potential customers are using new ways to search for you, most of them online. 3) Claim your listings on free sites. Make it easy for potential customers to find out more about you and your services by taking advantage of free listings. Yelp.com and TotalHousehold.com, for example, are great resources that allow you to list your business information for free. Both profiles can be enhanced with photos and reviews. TotalHousehold.com, which is a website specifically designed for home improvement contractors, also allows you to include license and insurance information, credentials and association affiliations all for free. We all tend to remember the problem jobs, but the ones that go well are the most important. Encourage satisfied clients to share their opinions on all of your digital channels including your social media pages, free web listings and your own website. 5) Maximize social media to boost word of mouth. You might still think of social media and smart phones as things your kids use, but both are very effective business tools. Users are now older and more affluent, which means you need to maximize your social media potential! Facebook, Google+ , Twitter and even Pinterest are ways to enhance your business and increase word-of-mouth. With these 5 marketing-musts your business will be able to gain more leads and will be well on it’s way to becoming more sustainable! If you need assistance in any of these areas, feel free to contact us at info@totalhousehold.com or 1-800-325-4315 for a free marketing consultation.